Steven (Chicagoland, United States) on 2 October 2014 in Architecture and Portfolio. The Frank Lloyd Wright Home and Studio at 951 Chicago Avenue in Oak Park, Illinois, has been restored by the Frank Lloyd Wright Preservation Trust to its appearance in 1909, the last year Frank Lloyd Wright lived there with his family. Frank Lloyd Wright purchased the property and built the home in 1889 with a $5,000 loan from his employer Louis Sullivan. He was 22 at the time, and newly wed to Catherine Tobin. The Wrights raised six children in the home. The building was listed on the National Register of Historic Places in 1972 and declared a National Historic Landmark four years later. The original 1889 structure was quite small. The home was extensively remodeled in 1895, when among other changes the kitchen was enlarged and converted to a dining room, the upstairs nursery was expanded and converted for use as Catherine's dayroom, and the Children's Playroom and a new kitchen were added to the back of the house. A second major addition was made in 1898, when the Studio and Connecting Corridor were built. In the Studio, Frank Lloyd Wright and associated architects like Walter Burley Griffin and sculptor Richard Bock advanced the Prairie School of Architecture and designed many notable structures, including the Robie House, Unity Temple, the Laura Gale home, and the Larkin building. After 1909, the Studio was converted into a residence for his wife and the younger children. Later on, the Home and Studio became an apartment building. In the 1960's, it fell into disrepair as the owners began to neglect the property due to financial problems. 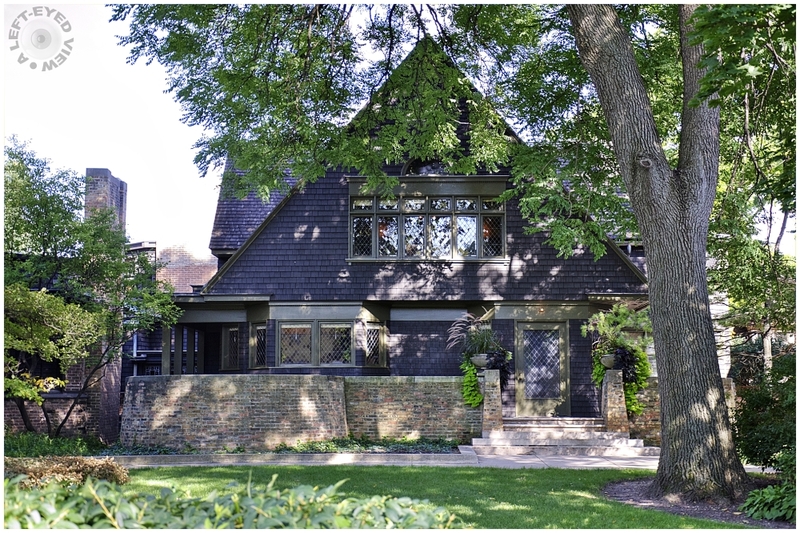 The longtime roofing company entrusted by Frank Lloyd Wright, Oak Park-based Tuscher Roofing, took control of the property. In 1974, the structure was handed over to the National Trust for Historic Preservation and restoration soon began. The Home and Studio was declared a National Historic Landmark in 1976, and has received the American Institute of Architects' National Honor Award. It is owned by the National Trust for Historic Preservation, and has been restored, maintained, and operated as a museum by the The Frank Lloyd Wright Preservation Trust. Superbe le triangle du toit avec ce vert quelle vue merveilleux. I remain in awe of this series. Une très très belle série. Also very beautiful ! A superb composition ! So this is where the master did his work. I love his buildings. Wow, $5,000 was a goodly sum in 1889, and at only 22 years of age, his employer Louis Sullivan had a good sense of FLW's potential. I wonder if any employer would put such faith and trust in any employee today. Your photos and in information you're sharing is magnificent. An American master, thanks for posting this. Wonderful capture of a beautiful residence. It's fun to see an early house that was lived in by this famous person. A nice shot of this unique place. this home still looks more modest than the ones he designed for others, despite the additions that were made to it! he was quite a creative sould, wasn't he ?!? The house looks in pristine condition. The high level of detail in the image adds to the excellent visual. with beautiful frame, colors, lighting, shadows, textures & reflections! Excellent continuation of your Wright series. Very cool shot. I do like A-frame houses. This is such a beautiful home. I really like it. I am glad that it was restored and is part of the National Trust. Wonderful narrative and a spectacular series!